Seeking out information on your next vehicle purchase is important. 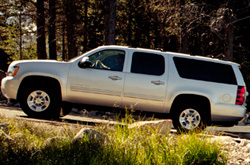 That's why we take the time to create reviews on the Chevrolet Chevrolet Suburban. It's hard to find the hard facts all in one spot. Midway Chevrolet arranges these reviews so you have the best resources from the best writers. Everything perspective car buyers need to make smart decisions is right here - each passage is brimming with [helpful data and specs - all at your fingertips. Happy hunting! What are you waiting for? Find your Suburban now! 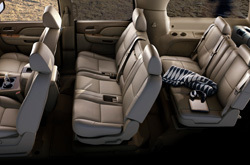 Compare the 2013 Chevrolet Suburban to vehicles like the 2013 Dodge Durango, Nissan Armada, Buick Enclave, Ford Expedition EL and the Toyota Sequoia, and you'll catch that the Suburban beats out the competition in many areas. Look over our Quick List below to find out why! You won't get Chevrolet trained service techs, a long warranty on service and accredited Chevrolet parts at a conglomerate auto facility in Phoenix, so visit Midway Chevrolet instead. Even the quality Chevrolets in Phoenix can take a beating, so turn to the Chevrolet service and autp repair wizards in Phoenix at Midway Chevrolet. We handle a multitude of jobs with no trouble, including Chevrolet windshield wiper replacement, tire alignment and checkups and, of course, demanding tasks like engine repair - and this is just a tiny part of what we can handle. Beyond this, Midway Chevrolet's always got reasonable prices on Chevrolet repairs in Phoenix, even for simple OEM recommended maintenances. Take a look below to view money-saving service specials.